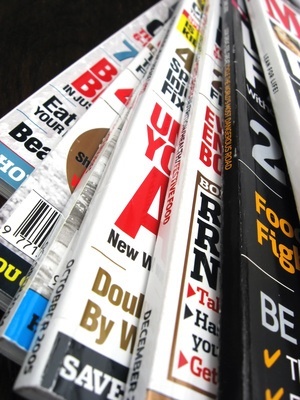 Studies show ads on the cover of magazines outperform inside premium pages. You’ve seen them. Ads that are now on the cover of magazines. In an effort to counteract the decline in ad revenue, some magazines are now selling ad space on the cover of the magazine. Nat Ives, writing for Ad Age referred to recent research that indicates cover ads outperform other ads which are in premium positions on the inside of the magazine. In his article, Ives referenced research conducted by Affinity’s Vista that indicated front cover ads ran in Parent & Child for Juicy Juice, SunnyD Smoothies and PediaSure generated action among 73% of readers compared to 71% for ads opposite the table of contents, 66% for either the back cover or inside front cover and 65% for ads on the inside back cover. The research also indicated the front cover ads averaged a total recall score of 78% outpacing a total recall score of 69% for ads on the back cover and the page opposite the table of contents. A cover ad for Thomas & Friends DVD scored 85% for total recall, much better than the average recall for ads inside the magazine. But the ad produced action among 65% of readers, lower than the 69% average of all ads. But this was possibly due to the fact the product targeted moms with children only between 2 and 5 years old. However, the practice is highly controversial. Sid Holt, CEO of the American Society of Magazine Editors stated, “The short-term gain is outweighed by long-term damage to the editorial integrity of the publication, which in turn devalues the magazine as a vehicle for advertising.” But as the pressure grows to replace lost revenue for many magazines, the practice is expected to increase. So given the opportunity to place ads on the cover of relevant magazines, the research indicates, those ads can be more effective than any other premium placement. However, as Tom Robinson, managing director of Affinity stated, “It does depend on the execution.” Even superior placement can’t make up for the lack of an effective marketing message.